A Brahmin named Sarveshwara Sarma lived in the renowned town of Kasi. He was regarded as an expert in the medicine administration. People had so faith in Sarma that a dose' of medicine administered by him would cure any ailment and remove it from the root, out of the body. He was blessed with four sons. After the fourth son birth, unfortunately his wife died of neo-natal problems. Since then, Sarma took care of his children taking both the roles of mother and father very carefully. Sarma's sons grew and with time, they became adolescents. One day Sarma went into the nearby forest to get some herbs and roots for medicinal preparations. While he was searching for specific varieties in the dense forest, a tiger pounced on him killing him on the spot. It took about three to four days for the news to reach Sarma's sons in town. They performed last rites to the mortal remains of their father. After the funeral, all four sat together and were worried about their future and livelihood. They could not succeed in getting the right employment, as they were not highly educated and not matured enough to meet the world. Eldest of the children told his younger ones like this, Dear Brothers! With the little knowledge and education it became clear that we cannot eke out a living in this town or somewhere else. There is a pounding need for all of us to learn one or the other science and become authority in that discipline. We cannot augment our standards if we are sticking to this Kasi town. We should go to different directions for transforming ourselves as experts. We have to select different directions. I being the elder will head towards North, youngest one should head towards South. The second and third brother will select the East and West directions independently. Exactly after a lapse of two years, we all shall return and meet near the Indian Birch tree near the forest. All the other three agreed to the proposal. Selling the house, they headed in the agreed direction sharing the dreams equally. The wheel of time spun. As decided earlier, all the four brothers assembled at the Indian Birch tree at the end of the second year. Everyone discussed in detail fondly about the knowledge and skill they acquired during the separation period. Eldest one explained that, If I'm given a bone of any dead species, without any prompt I can create flesh and fat needed for the creature. Then second one started, Based on one limb I can create the rest of the body. I can create skin to the creature, added the third one. Youngest one claimed that he could do a thing that cannot be done by all three of his elder brothers. Interested, all the three questioned, What can you do? I can put life into the carcass! claimed the youngest with pride. The other three agreed that it was something that they could never work successfully without and praised him. After a while, the eldest one thought that it would be better to put to test the skills acquired and communicated the idea with his brothers. Brothers! I will search for a bone in the jungle and comeback. Once I comeback let us put our knowledge to test whether they really work or not. said the eldest brother and went into the woods. Then, it was the third one's turn. He sat on the body of flesh and prayed in his own style and manner. To everybody's surprise, the skin formed over the body of flesh. The youngest one making his elder brothers move aside, It is my job now brothers. Keep on looking how this dead animal comes to life. Using his skill, he murmured some clearly inaudible hymns for about half-an-hour. After completing his chants, he took some water in his hand and sprinkled over the body tiger carcass. Tiger came live with a roar. Instantly it jumped on the brothers and killed all of them chasing one after the other. The Bhethala stopped his story there. Bhethala asked, Hey King of Kings! Vikramaditya! Now tell me. 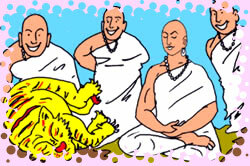 Who among the four should bear the sin of killing the Brahmin men? Knowingly if you avoid speaking the solution, your head would blow out to a thousand pieces. Vikramaditya, with all the royal smiles started answering. There is no harm on creating flesh, fat, limbs and skin of the tiger, here. The Brahmin men were dead just because the cruel animal came to life and portrayed its natural evil work. Hence, it was the person, youngest of them all, who should bear the sin of killing the Brahmin men, since he brought back the dead tiger. Bhethala convinced with Vikramaditya's reply and zoomed off with the corpse back to the treetop.